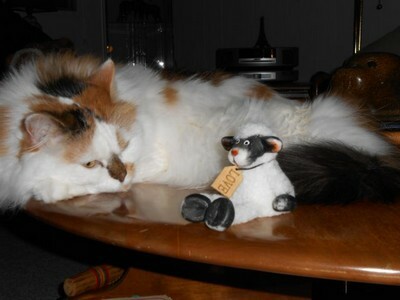 Cadi, my Calico cat, has recently chosen to lie down close to a small lamb that I brought from Ireland last year. I saw it in a village store on the west coast of Ireland and fell in love with its simplicity and message tag, "Love". As I captured the photo above (just missing one where she leaned on the lamb's head), I idly wondered what was going through her feline mind. The Latin origin of 'feline' is 'happy, lucky, fortunate', and Cadi is Gaelic for 'simple happiness'. 'Lucky and fortunate' are appropriate, as she just has three legs, but is a whirlwind of motion at the window if another cat appears on her driveway! As I observed Cadi beside her unusual companion, my thoughts drifted back to my Pilgrimage in Ireland and a wise young person who inspired me as we stood chatting on a street corner near Galway, waiting to re-board our bus. She believed that we are all a piece of a beautiful mosaic, and without each one of us the mosaic would not be complete. This was our first close encounter on the trip but I will never forget the wisdom we shared, and my connection with an insightful spiritual 'teacher', perhaps 40 or 50 years younger than me, who wore long gypsy style skirts and had hair streaked with a multitude of bright colours. Perhaps we looked like a motley duo on that street corner, but I will always be grateful I heeded my inner 'voice' to introduce myself. I have an ongoing love of inspirational quotations, and the one above by Emerson is the first one that 'spoke' to me back in my teenage years. If you are standing in a queue at a store or library, perhaps consider chatting to the person beside you, even if - or especially if - there is a generation gap. That person, younger or older, may be YOUR 'superior' and greatest teacher, or you theirs. I once asked a young teenager, waiting for his girlfriend to try on clothes at The Bay, for his opinion on a jacket I was considering purchasing; his reply was perfect, and when his friend returned we had a warm three-way conversation, and learned he was studying fashion design. In that moment we were each a piece of a colourful mosaic... and so are YOU!